This week on CTV Morning Live, Chef Jason Wortzman makes a dish that will delight the children, as well as the adults – Oven-baked Panko Parmesan Turkey Fingers. 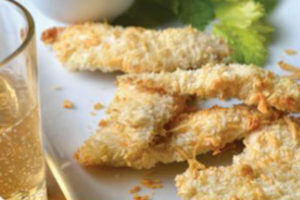 Homemade turkey fingers are delicious and easy to make. Pair this dish with rice and vegetables, or a salad for a well-balanced meal. The secret to making these turkey fingers crispy in the oven is the oil in the Panko crumbs mixture. Mix Panko crumbs with olive oil, parmesan and paprika in a separate bowl. Taking a few turkey breast strips at a time, first dredge them in flour, then dip them in egg, and roll them in the Panko mixture until they are well coated. Place flat on a baking sheet and bake for 20 minutes, turning once after 10 minutes. Serve with honey dill sauce.